James Harden plays basketball like a video game character: all 3s, dunks, and layups. About 87 percent of his shots come from either near the rim or beyond the 3-point arc. He’s great in both areas, but make no mistake — it’s his ability to create and convert opportunities at the basket that makes him special. He’s incredible off the dribble, in transition, and in pick-and-roll situations. He has a high basketball IQ that’s most obvious in the two-man game, in which he reads and reacts better and faster than almost any other NBA player. Simply put, Harden is an elite player for two reasons: his ability to create close-range shots, and his ability to make long-range shots. When you look at his shooting chart, you realize it’s almost as if mid-range shots bore him. One thing that is commonly overlooked in shooting evaluations is the basic ability to get shots. Dunks and layups are the most efficient shots on the floor, but for most players, they are hard to come by. Harden is great not just because he makes shots at high rates, but also because he creates the type of shots convertible at those rates. Not many guards in the NBA can generate effective close-range chances in the face of the defense as frequently as Harden, and this area represents the biggest gap between Harden and probable replacement Kevin Martin. Last season, 42 percent of Harden’s field goal attempts were close to the rim, and he made 62 percent of them. For Martin, only 20 percent of his field goals were in this area, and he made only 53 percent of them. This means fewer layups, dunks, and free throws for the Thunder, but more for the Rockets. 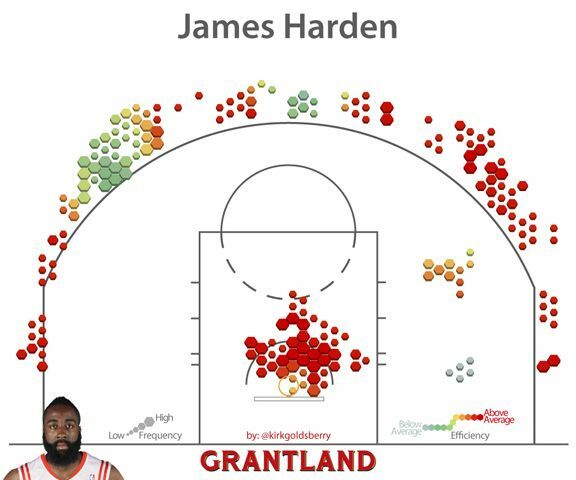 Harden combines that ability at the rim with being a very good and very willing 3-point shooter, especially from the wings. Last season, almost a third of his field goal attempts were 3-point shots along the wings, and he made about 40 percent of them, much higher than league average. 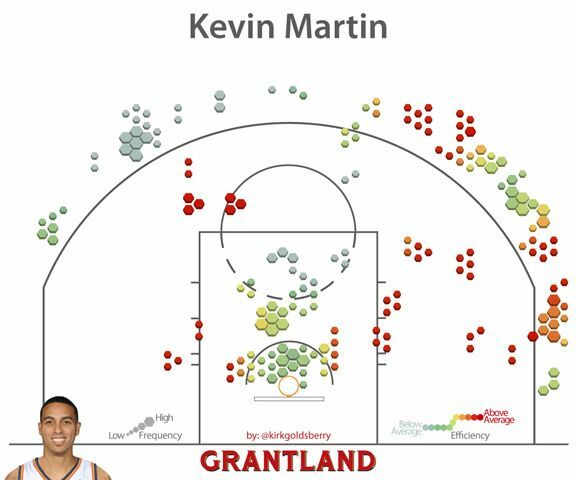 Martin also loves shooting 3s, but he isn’t nearly as efficient. Although Martin hit more than 38 percent of his 3s two seasons ago, last year, he made less than 35 percent. Martin is a good player, and a capable NBA scorer, but he’s much more of a typical NBA shooting guard than Harden; he relies more on jump shots than he does on penetration. Like Harden, Martin’s favorite 3-point shot has been along the wings. Unfortunately, as his shooting chart from last year shows, Martin’s ability to make these shots has decreased recently, especially along the right wing. Kirk Goldsberry (@kirkgoldsberry) is a professor, a cartographer, and a contributor to Grantland.